What makes Google and other search engines, display some sites all the way at the top of the first page of search results listings, while other sites don’t even appear on page 57? The answer is: the best performing web sites have implemented Search Engine Optimization (or SEO). Each search engine uses its own complex algorithm that takes into account dozens, or perhaps even hundreds of factors. Ever since we all started using search engines to find stuff online web site developers have been trying to figure out bits and pieces of the SEO puzzle. That on-going process is what search engine optimization is all about. Every once in a while someone manages to reverse engineer Google to find a secret or two of what makes it work. When they find these golden nuggets, web designers and developers try to exploit the new SEO knowledge to ‘trick’ Google into giving their web sites top rankings. If you could implement a few of these secrets on your web site that would translate into higher traffic to your site — free traffic at that — that can then be turned into new business — more clients or more customers. When you do a web search on Google, and other search engines, they tend to display 10 organic listings by default, and most of us only bother to look down the first page. Most of us are satisfied by the results we get from page #1 of search results, but that also means that if your site is ranked at page 5 it will get significantly less traffic — if any at all. In fact, the number of people who click through the listings diminishes rapidly as we move down the page. Google statistics show that 42% of searchers click the #1 listing on any given keyword search, 12% click on #2, only 8.5% on #3 and 6% on #4. This clearly illustrates the need to be on top of page one! 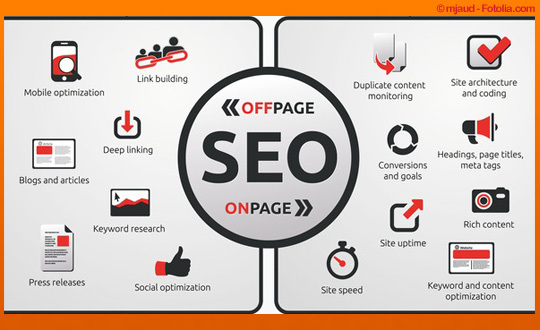 Search engine optimization consists of two sets of tactics: on-page optimization and off-page optimization. The page’s primary headline (as indicated in the HTML by the H1 tag). The length of time your domain name has been registered for appears to matter, too. In addition, the way the page content has been written seems to count more nowadays than it has in the past. For example, try to use words that are related to your page’s main focus keyword phrase. This is called latent semantic analysis. For a keyword phrase that has little competition — few other web pages trying to get ranked for it — good on-page SEO can often be all you need to get a good results. However, in the real world most of the keywords we want to build pages around, and get traffic for, do have lots of competition. That’s when off-page SEO becomes so very important. What is off-page search engine optimization? To understand how this works we have to go back to see what made it all happen for Sergey Brin and Larry Page who started Google in March 1996. Their breakthrough was to realize that if web page ‘A’ on one site had a link on it to web page ‘B’ on another site, that link could be taken as a vote of confidence. So the more links that a page had pointing to it from other web sites, the more of an authority that page could be assumed to have. These backlinks are still one of the main factors that drive off-page search engine optimization: generally speaking, the more backlinks you can get, the higher your pages will be ranked by Google and other search engines. For example, you can explore links to my own site by visiting this page. Building backlinks to your pages is a relatively simple process, albeit somewhat time consuming. The trick is to find other so-called authority web sites that allow you to create links to you own site. One way to start building quality backlinks to your site is to do a Google search for one of your own keywords and see which sites are displayed in the so-called “organic” search results, and then visit those sites. If the sites are blogs, you can regularly comment on their blog posts — make sure you say something constructive — while linking your business or name to your own web site. You can read more on Search Engine Optimization on my blog, or call me for a free SEO assessment of your own web site. You can also download Google’s own Search Engine Optimization Starter Guide.